I don’t talk much about my job. And, no, it doesn’t have anything to do with food. My friends hear me rant about my work but I won’t get into that today. Where I work, I can listen to audiobooks. That’s how I get so much reading done. For about seven hours a day, I listen to books. This one was no different. I had to watch a Ted Talk of hers for a class I’m taking this summer and I finally decided to take the plunge. Knowing that I don’t have a lot of time, I went for an audiobook and this was the only downloadable one my library had. The second point about my job: We’re very food oriented. I don’t work in the food business, but we have a full functioning kitchen. Fridge, two microwaves, sink with maybe a garbage disposal, dishwasher, bread maker, panini press, and I think a portable stove for when we need that since we don’t have it. Oh, and we often have potlucks and all that. This was probably the worst choice to listen to. I had to eat or else people would find it weird, yet I was nauseous/uncomfortably full for no reason. However, that only happened three times. 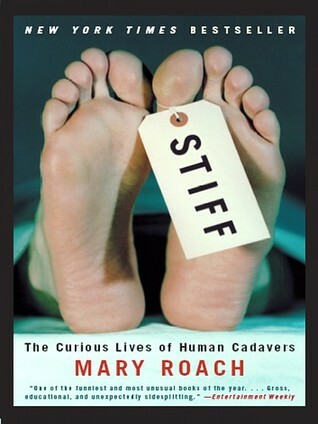 Out of this whole book about death and cadavers, only three chapters made me nauseous. Decomposition, medical cannibalism, and burial specifically. Those got to me, but it’s not a book for the faint of heart. Most of the time, I was just able to push back the things that grossed me out because they were super interesting. The gross factor aside, this was a great book. It would have been better if Mary Roach ready it to you, but oh well. The reader tried to capture the humor, but it didn’t always work out. I still found myself laughing or smiling because, even if the reader didn’t get it, I could tell there was deadpan and sarcastic humor there. In sum: This is a good book. Funny to break the tension that this topic brings up. But not too funny. There are points that are grosser than others. I doubt that people will get grossed out at the same points I did, but it’s chock full of things that could be nauseating to others. Still good, just be careful if you have a weak stomach.